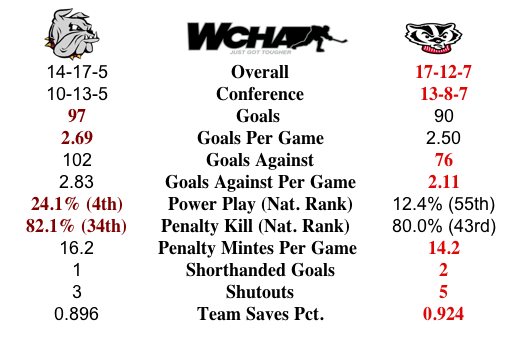 Drawing to the end of the regular season, a non-conference series may just be what the Bulldogs need. Now is the time to get on a roll and pull things together. 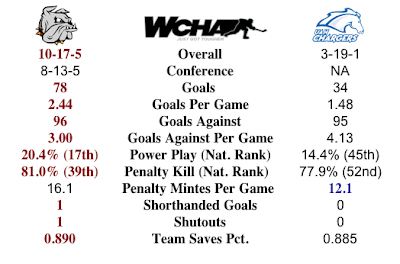 The opponent is UAH, the Chargers, who have been accepted into the new look WCHA for next season. For this season they are playing an independent schedule and have amassed an NCAA record of 3-19-1. Two of the wins are against Division III opponent Finlandia. Additionally UAH played seven exhibition games resulting in a record of 5-1-1. UMD is currently on a nine game winless streak at 0-7-2, the longest such streak since 2000-01 season. As much as UMD has struggled over the past nine games, they have played well at times and must pull together to get on track this weekend. In the 23 NCAA games played, the Chargers have two players tied for leading scorer at 10 points, sophomores Jeff Vanderlugt and Kyle Lysaght. One significant change from last year’s UAH team that visited Duluth is the departure of goalie Clarke Saunders. Saunders used last season’s uncertainty of the UAH program to take an NCAA transfer to North Dakota where he is splitting time with Zane Gothberg. Saunders’ replacement at UAH has been goalie by committee, similar to UMD, using three netminders. But for the Chargers, the numbers have not been good for the goalies with leader John Griggs with a respectable 0.894 save percentage, but an alarming 3.95 GAA. The Bulldogs may be drooling at the defensive numbers put up by the Chargers, but UMD definitely has something to prove. The Bulldogs have only scored 15 goals in their nine game winless streak. StatPack. The stats looked similar last weekend, but against UMD. The results of the weekend were two close games with the Gophers. The obvious disclaimer of stats need not be stated. 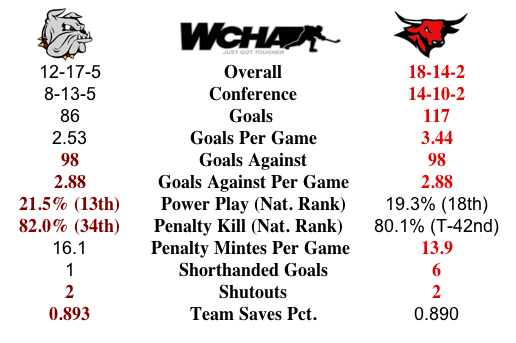 Both the PP and PK of UMD improved with a good showing last weekend. Goals per game for the Bulldogs has steadily been going down. This may be a good weekend to help buoy the number. UMD continues to be in the top three nationally for average penalty minutes. 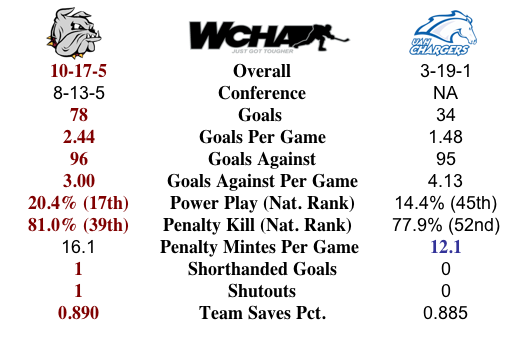 UAH is just four minutes greater than the national leader in fewest penalty minutes, Saint Cloud State. This series marks the end of the season for UAH. Farley Charging. Fresh off a three goal weekend, look for Austin Farley to become more consistent. The maturation of Farley and fellow freshman forward Tony Cameranesi is the future of scoring for UMD and these last weeks of the season should give a preview of what to expect going into next season. Final Words. UMD looked good last weekend in gaining one point at UMTC, but the weekend before they looked like a team that had given up during a one point weekend at BSU. This is the weekend to put it together, feel success again, and start a run towards the postseason. For UMD fans this upcoming series against the Chargers is the one they are hoping will resurrect the Bulldogs offense and all-around team play. The Chargers only have one Division I win this season and that win dates back to mid-November, so all indications are that this will be a UMD sweep. Anything less than two wins would be a disappointment. There are a few other great series in college hockey this weekend, both in the WCHA and outside the WCHA. Hockey East has two series to watch as Merrimack is up against Lowell in a home and home series and BC is taking on Providence. These games very well could decide the Hockey East champion. In the ECAC St. Lawrence is going to Troy, NY to play RPI for two games. Now the ECAC regular season title won't be going to either one of these teams, but both are NCAA bubble teams and the outcomes could impact how long their season extend. Bemidji State at North Dakota: The Beavers have always struggled against North Dakota and this series definitely favors North Dakota. Scoring is a not the Beavers strong point and right now North Dakota's offense is clicking, in the last three games North Dakota has scored 15 goals. This will be a North Dakota sweep. Denver at Minnesota Twin Cities: It is hard to predict what Denver team is going to show up, the one that can score or the one that doesn't. I think we will probably see both teams this weekend. The Gophers played good last weekend and got three points at home against the Bulldogs, but they did have some struggles at times. This looks like a split. Michigan Tech at Saint Cloud State: The Huskies of Saint Cloud are controlling their own destiny and I don't think the Huskies from the U.P. will be able to slow them down much. This series in Saint Cloud should result in a Sweep for Saint Cloud. Wisconsin at Omaha: The Badgers cruised past the Nitany Loins on Sunday only to follow it up with a stunning loss. This one loss alone had a big impact to the Badgers NCAA hopes. They will likely playing this series with some urgency. The Mavericks have had two weeks to prepare for this series and they are also playing for their NCAA playoff future. My guess it the Badgers defense will be enough to get a split. Alabama - Huntsville at Minnesota Duluth: This is a must win series for the Bulldogs. Not in the sense of playoff but more as a statement of the program as a whole. The Chargers only have one win all season against Division I teams and talent wise they do not match up against the Bulldogs. Bulldogs sweep. Alaska Anchorage at Alaska: This is a home and home series for the Governor's Cup. The Nanook's are the better of the two teams, but I think the home and home favors a split.